Take Some Responsibility - And Stop Making Excuses! Do you ever get on your own nerves? I do, all the time! Usually, it’s because I’ve wanted to get something done, but then been lazy instead. But more often than not these days, it’s when I’m trying to do something blogging related and can’t figure it out. Other than that, I’m a hoot, of course! I always make excuses for myself, but it’s time to stop and take some responsibility. After all, I am not setting a very good example for Molly if I don’t. Anyone that knows me knows I am a bit of a self-professed technophobe. I’m not quite sure when this happened. I used to teach ICT, and while it might have been pretty basic stuff, I knew my way around a computer. Can I claim baby brain almost four years later? Is that another excuse? Needless to say, by Sunday evening I still hadn’t gotten anywhere with all the GDPR malarkey. I was fed up, had a strop, and told myself I should just delete my mailing list to save myself at least one job. I’m sure Chris and my sister won’t mind if they don’t receive my enthralling email newsletter anyway! The GDPR deadline is looming though so I really do need to take some responsibility and get it done. No one is going to do it for me unless I pay for it. But that isn’t an option, so it’s down to me. In fact, I need to take some responsibility for everything to do with my blog. The writing part is fine, obviously, but because I don’t understand coding or the workings of the backend of my website, I always dismiss anything to do with them. I installed a caching plugin a few days ago and it wanted me to do something which I didn’t understand, so I deleted the plugin, instead of trying to figure it out. Who does that? Unless I am willing to pay someone to do these things for me, then it is down to me to know how to deal with these issues. It’s not just the technical stuff I need to take some responsibility for though. I need to apply it to all areas of my life. There is so much junk in my house just sitting there collecting dust. It all needs taking to the tip, yet, I haven’t moved it! I need to ring the health visitor and speak to her about some concerns I have about Molly. But have I phoned her yet? Nope! I want to make over my garden, but I can’t be bothered to make a plan and get started on it. I want to redecorate my house but haven’t bought any paint. Yoga is on my to do list and while I’ve bought a DVD, I haven’t actually put the DVD on yet. I am fed up of making excuses. I need to take some responsibility and just start doing the damn thing. The time I waste dwelling on the things I don’t know or haven’t done could have been spent actually learning or doing. I wrote a post not long back about taking one step at a time so maybe I need to take my own advice from this and slowly change the way I do things. Who is with me? Let’s step away from the excuses and take responsibility for the things we want or need to do. No one will do these things for us. And just think how accomplished we’ll feel with ourselves if we just do it. Do you make excuses for yourself like I do? How do you overcome these? I’d love to hear your tips in the comments below. Oh Sam, you and I more alike than I care to admit! I am just like this with commenting on blogs, including this linky. If I don’t sit and do them every night in the week I end up with a backlog of work to do at the weekend (like now, eek!). I’m so bad though and sometimes just can’t be bothered, especially if I make the mistake of putting the telly on! Let’s make a pact to try a bit harder! 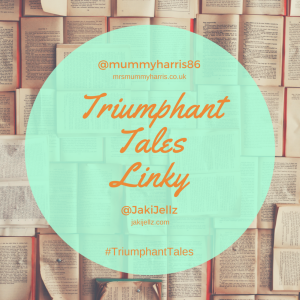 🙂 Thanks for sharing with #TriumphantTales. Oh my god it’s like you are talking about me. Only I haven’t even started the whole GDPR thing. In fact, I’ve been so busy with work and the kids (another excuse) I haven’t even looked into it. I’ve even considered just giving up blogging all together just so I don’t have to deal with it! I agree with you, it’s definitely time to give up the excuses and just get on with it.